Rajyashree Ramesh is a Certified Laban Movement Analyst pursuing academic research in embodied cognition. Her introduction to Laban Movement Analysis and Bartenieff Fundamentals in 2002 triggered a new journey into movement research. After certifying at the Integrated Movement Studies programme in 2008 and obtaining a Masters degree in Sociocultural Studies from Europa-University Viadrina in Germany in 2010, Rajyashree is currently completing her doctoral thesis, which is an empirical movement analytic study on the kinesthetics of meaning from a cross-disciplinary perspective (linguistic gesture studies, cognitive linguistics, brain research on emotions and Indian performing arts). 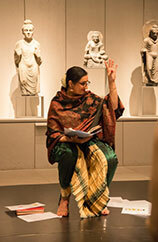 2014 – Invited for lecture and discussion with Prof. Gabriele Brandstetter on "Zeitgeist and Tradition in Indian Dance", Ballett-UniversitÃ¤t GesprÃ¤chssalon at State Opera Berlin. 2004: Can an ancient dance form like Bharatanatyam be copyrighted? http://www.narthaki.com/info/articles/art118.html and in Talam, special issue.